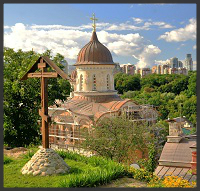 - Kiev-Center, Kiev-hermitage monasteries, Kiev-caves. If necessary, the duration of the tour can be reduced to two hours. Sightseeing tour (excursion) around Kiev consists of visiting of the most ancient part of the city - the City of Vladimir, the fortress of Russian lands, the remains of the Church of the Dime (989), the "City of Yaroslav", the monument of the ancient architecture, "Golden Gate", the Square of St.Sophia, the Square of Archangel Michael and monuments on it in honor of the holy enlighteners of the land of Rus, and the patrons of the city Kiev. 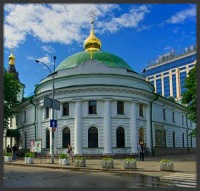 The pilgrimage also includes a visit of the modern Monastery of the Dime in honor of Nativity of the Mother of God and its objects of worship, the Cathedral of the saint Prince Vladimir, coequal with the apostles, (it is in schism), its relics: the relics of the great woman martyr Barbara and the priest martyr Makarius, the metropolitan of Kiev. The pilgrimage ends with a prayer at the miracle-working icon of the Mother of God "Support of the Humble" and a sightseeing tour to the Holy Convent in honor of the holiday” The Entry of the Mother of God into the Temple”. 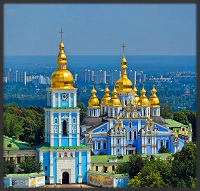 Combined, thematic pilgrimage (excursion) to the hermitage monasteries of Kiev. The first stop is at the Holy Convent in honor of the holiday “The Entry of the Mother of God into the Temple”, where you can offer your prayers to the Mother of God at her icon "Support of the Humble." Also very important objects of worship of the convent are the relics of the foundress of this convent, reverend mother Dimitra (Egorova) and reverend mother Olympiada, the abbess of Alekseev’s sisterhood of Arzamas. 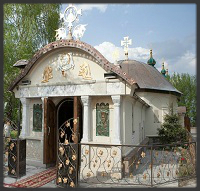 The second place of the visit is the Holy Trinity Monastery (the Hermitage Monastery of Kitaevo). Here are relics of the great Kiev ascetics St. Theophilus, the fool for Christ’s sake, and venerable mother Dosithea (under the bushel), who led a life of asceticism in the cave located on the territory of this convent. 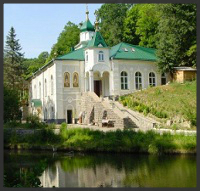 The next place of the visit is the Monastery of the Patronage of the Mother of God (the Hermitage Monastery of Holoseevo). Here are the relics of St. Alexis of Holoseevo, as well as the relics of the nun Alypia (Avdeeva), known in the 20TH century, the ascetic, the fool for Christ’s sake, many Kiev Church people asked her ecclesiastical guidance. Thematic pilgrimage (excursion) to the caves of Kiev. The first prayer in this pilgrimage takes place in the caves of the Monastery of Zverinets, in honor of the Archangel Michael and the reverend fathers of Zverinets, which is revived in our time. However, the caves, or rather the part of them, that was discovered at the end of the nineteenth century, was dug up as far back as in the 9th century, and relics of saints are reposing here. They led a life of asceticism in these caves. Famous among them are reverend fathers Clement, Theodore, etc. The monastery is decorated with two magnificent temples in Old Russian and Byzantine styles, in which there are venerable icons of the Mother of God: "The Icon of Zverinets", "Quick to hearken", "Consolation of All Who Sorrows". The second stop of the travelers takes place in the Hermitage Monastery of Kitaevo, where the pilgrims visit the cave in which the monk Dositheus led a life of asciticism, who turned to be a venerable woman, whose relics rest in this monastery under the bushel. 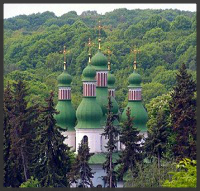 The pilgrimage finishes in the Monastery of the Nativity of the Virgin in Tserkovschina, where in ancient times reverend Theodosius led a life of asceticism, who was one of the founders of the Kiev lavra of the Caves. One of the names of these caves is Theodosius’s, they were founded by monks, who were leading a life of asceticism in them during the 11th-15th centuries. 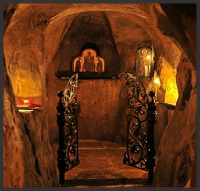 The structure of the caves of Tserkovschina is similar to the structure of the Kiev lavra’s caves, but these caves have been preserved almost in the same form in which they were initially. 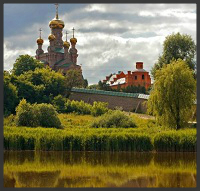 Pilgrimages (excursions) are available in Russian, Ukrainian and English languages. 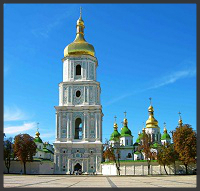 A donation for the pilgrimage (excursion) to the holy places of Kiev (3 hours) is stipulated when ordering. 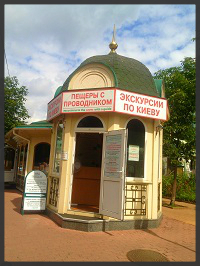 The place of gathering and departure of groups for excursion is located near the entry gate to the monastery at the barrier - the kiosk of the Pilgrimage department, and also in the building № 39 (Pilgrimage department). The nearest metro stations are Arsenalnaya and Pecherskaya. 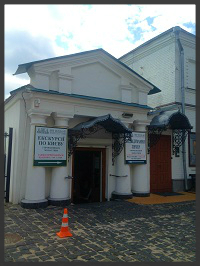 You should go to the street Lavrskaya 15, to the entrance of the Lower Lavra. 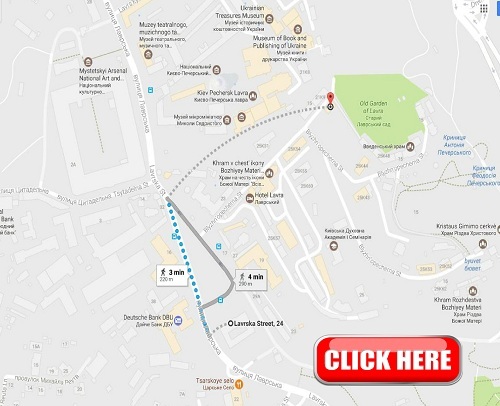 The nearest public transport stop near the entrance of the Lower Lavra is the ending stop of the bus No. 24, the trolleybus No. 38, the minibus № 520, № 470. 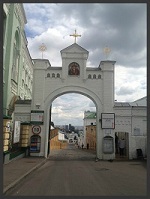 To the Pilgrimage department (building 39) you may go straight through the arch No. 1, No. 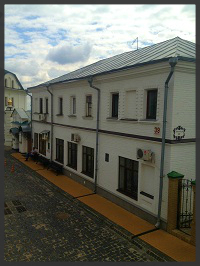 2, passing the worshipping cross, behind which there is a two-story building, room 39.